The inauguration of Andhra Pradesh's new capital city is a valuable time to take stock of India's urbanisation prospects. 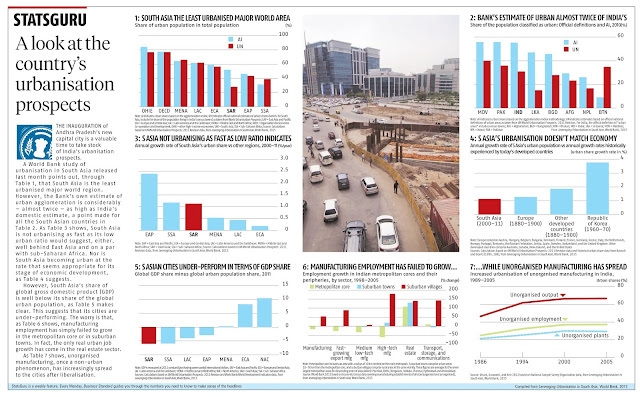 A World Bank study of urbanisation in South Asia released last month points out, through Table 1, that South Asia is the least urbanised major world region. However, the Bank's own estimate of urban agglomeration is considerably - almost twice - as high as India's domestic estimate, a point made for all the South Asian countries in Table 2. As Table 3 shows, South Asia is not urbanising as fast as its low urban ratio would suggest, either, well behind East Asia and on a par with sub-Saharan Africa. Nor is South Asia becoming urban at the rate that seems appropriate for its stage of economic development, as Table 4 suggests. However, South Asia's share of global gross domestic product (GDP) is well below its share of the global urban population, as Table 5 makes clear. This suggests that its cities are under-performing. The worry is that, as Table 6 shows, manufacturing employment has simply failed to grow in the metropolitan core or in suburban towns. In fact, the only real urban job growth has come in the real estate sector.